AV3 is a visual production company specialising in video solutions for the entertainment industries. Challenge: Optoma was approached by television production company, North One Television, to help create the centre-piece of the Christmas Special for Channel 4’s popular weekly programme, Gadget Man. Solution: Visual production company, AV3, projection mapped the Gadget Man house, onto which a series of Christmas animation sequences was projected. Two powerful 7,500-lumen EH7700 projectors were stacked with the Chameleon GB-200 to double the brightness and create a stunning effect. 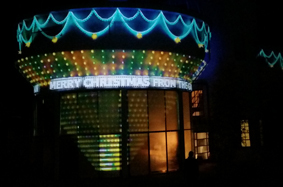 Results: Presenter, Richard Ayoade, triggered the projection to reveal the brilliant festive display which included Christmas lights hanging from the top balcony, holly seemingly coming out of the brickwork and a carousel of lights spinning around the central cone of the house. Gadget Man Guide to Christmas was broadcast on Channel 4 on Monday 22 December. The series, Gadget Man, has a weekly audience of 1.5m gadget-loving fans. It is produced by North One TV - one of Europe’s biggest and most respected independent media companies. For over 20 years North One has been recognised as a global producer of world class entertainment, factual, digital, sport and live event programming. Optoma was approached by television production company, North One Television, to help with the Christmas Special of Channel 4’s popular weekly programme, Gadget Man. The core theme of the Gadget Man is how gadgets can solve life’s problems. In the Gadget Man Guide to Christmas, Richard Ayoade is keen to get festive - but doesn’t want the hassle involved in stringing hundreds of lights around the Gadget Man house. He reveals, with the aid of gadgets, he doesn’t have to! The team wanted to show that the same stunning display can be created in half the time by projecting Christmas lights onto the house. 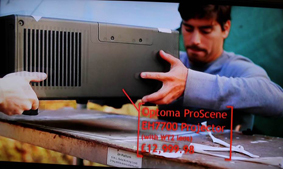 Optoma loaned the company two powerful Optoma ProScene EH7700 projectors with ProScene WT2 (wide) lenses. These WUXGA projectors produce pin-sharp imagery and have a brightness of 7,500 lumens. To ensure the effect was sharp and brilliant on camera, the projectors were stacked with the Chameleon GB-200 to double the brightness. Stacking can reduce the overall cost of an installation and increase reliability. A single projector of equivalent brightness is generally more expensive and bulkier. Stacking therefore enhances portability with smaller, lighter units which are easier to transport and install. It improves reliability (if one unit fails, the second unit will still work) and it allows scalability with the ability to add more projectors if a higher brightness is needed. A photograph was taken of the Gadget Man house, which visual production company, AV3, used as the basis for projection mapping the building. AV3 then created a series of animation sequences including Christmas lights dropping from the balcony, rotating snowman and sparkling holly that would be projected onto the house. The projectors were placed in exactly the same spot as where the photograph was taken from so that the animation would fit exactly onto the house. 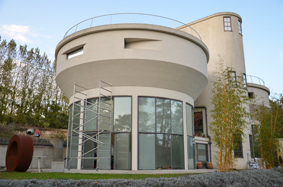 To capture the whole of the house the platform for the projectors needed to be set back 20m from the building. The episode featured celebrities Stephen Merchant, Jessica Hynes and Adam Hills. 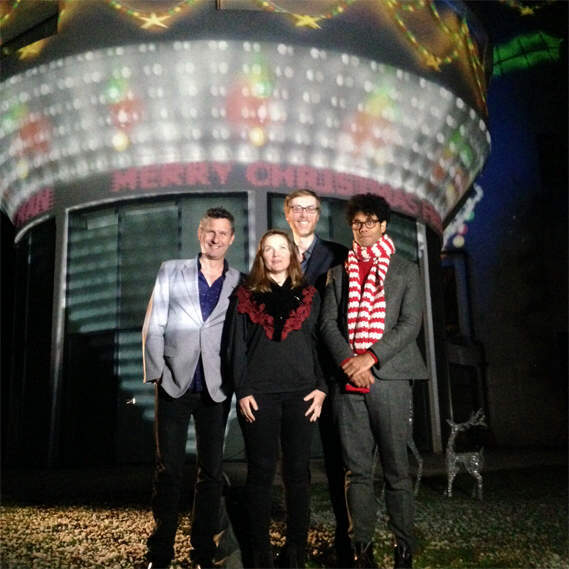 They joined Richard Ayoade as he triggered the projection to reveal the stunning festive display. The animations projected included holly seemingly coming out of the brickwork and a carousel of lights spinning around the central cone of the house, and, of course, the traditional chain of Christmas lights hanging from the top balcony. Two Optoma ProScene EH7700 projectors stacked for double the brightness with the Chameleon GB-200.